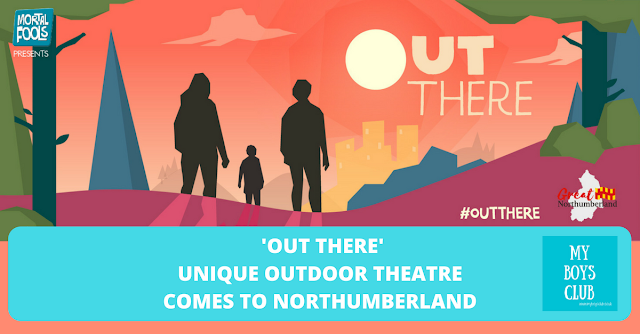 "Out There" a unique outdoor theatre performance from Mortal Fools and Tyne Valley Youth Theatre is coming to Prudhoe this weekend - Saturday 14 & Sunday 15 July. We've been working with the organisers to bring you a preview. Where did you grow up? Sometimes I think I maybe never did but my childhood was split between the Midlands and the North East. In a corner of the region where Northumberland, County Durham and Tyne and Wear converge. We lived in a rural area with plenty of green fields, rivers, stepping stones and bus stop shelters but little in the way of community amenities. A new on-off unique production is coming to an area not far from where I grew up this weekend and I’m really intrigued to see what it’s all about. Out There will be performed in Prudhoe and is all about what it’s like to be out there; young and living in Northumberland today. 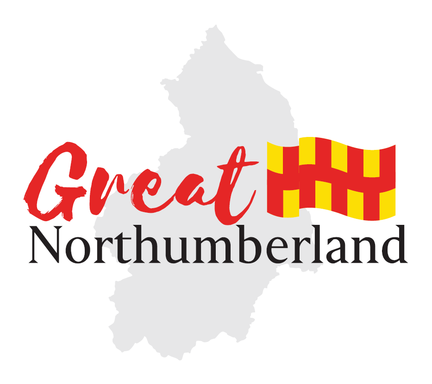 What young people feel about coming from Northumberland; a place where they live, grow, explore and also where they are going next. Out There is a unique piece of theatre by Mortal Fools aimed at reminding the audience what it’s like to be young, exploring the world for the first time, being excited at not knowing what’s next. When is Out There taking place? Please arrive on site 5 minutes in advance of your time slot. Where can I see Out There? Prudhoe is in Northumberland, but south of the River Tyne. It is half an hour (11 miles) from Newcastle by car and can also be reached by rail and bus. The town also has a castle. How long does Out There last? How far will I have to walk to see Out There? The walking route is just over a mile in distance, and you will be on your feet walking or standing for the duration of the performance. What should I wear to watch Out There? Dress for the outdoors and the weather. This is an outdoor walking performance on countryside ground, so expect some semi-rough ground and slight inclines; appropriate footwear such as walking boots or sturdy shoes are advised. The performances will take place in all weathers so please dress for all weathers and bring a waterproof. Is Out There a stage production? 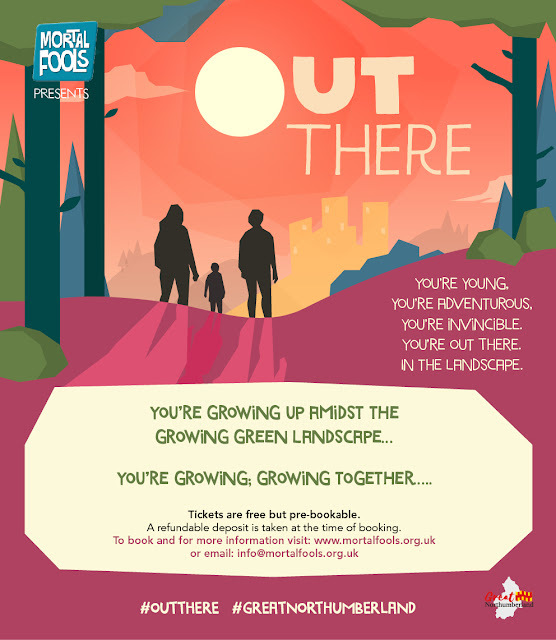 No, this is a special, one-off outdoor theatre production set against the backdrop of the lush Northumberland countryside, in the rural Prudhoe’s Riverside Country Park. Wearing silent disco headphones, you'll go on an outdoor theatre walk to hear stories and see performances about what it’s like to be out there; young and living in Northumberland today. Car parking is available on site for the duration of the show, but attendees will be asked to leave the car park to enable space for the next show’s audience. How much does a ticket for Out There cost? Tickets are free but audience capacity is limited, so pre-bookable spaces for Out There in Prudhoe are available online. Please note a £3 refundable deposit is taken at the time of booking and you can claim this back at the end of the performance. Mortal Fools is also a registered charity and will happily accept donations if you enjoyed the show. Who is Out There aimed at? Out There is aimed at high school children and their parents and carers. I'll be takuing my 9 and 11 year olds to see it at the weekend - so really teens and tweens rather than smaller children for this one. Who is performing Out There? Mortal Fools and their flagship youth theatre, Tyne Valley Youth Theatre, will perform a very special, one-off outdoor theatre production which will take you on a vibrant journey through what it is like to be young and live in Northumberland today. All of the actors have been born since the turn of the millennium. Out There from Mortal Fools is a part of Great Northumberland 2018 - 56 days of free arts, culture and heritage events in Northumberland. Northumberland is a place unlike anywhere in England, with unique traditions and culture. It is a place of rich heritage to explore, a place where history comes to life, but it is also a forward-looking county, embracing and looking to the future with digital and environmental innovation. Music, dance, and art will meet the 21st century throughout the 8 weeks of events. From castles and heritage sites, cycle routes, beaches, coastal walks, theatre, music, film, exhibitions, and adventure, there truly is something for everyone in Northumberland. Do let me know if you get tickets and go along. Disclosure: This is a sponsored post by Mortal Fools.